Today’s the start of something BIG--Jupiter. In the ancient Roman religion and myth, Jupiter or Jove was king of the gods and also the god of sky and thunder. The Romans regarded Jupiter as the equivalent of the Greek god, Zeus. 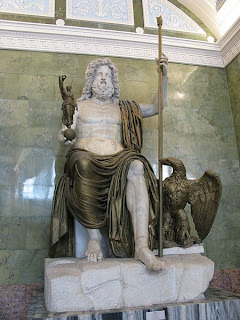 In the Greek tradition, Jupiter/Zeus was the brother of Neptune and Pluto. Big as a planet, Jupiter is also a big deal from a mythical perspective. Let’s explore Jupiter, planet of optimism, enthusiasm, expansion, goodwill, religion and philosophy, good fortune, travel and higher education. If you’re joining us in progress, please read the background post about about our May Planetary Fishing Trip. Enjoy the journey, one of Jupiter’s specialties! And don't forget, the sign of Pisces is co-ruled by Jupiter, who has had more experience with Fish than Neptune. Until Neptune was discovered in 1846, Jupiter was Pisces' sole ruler (no fish pun intended). 1. As I did with Venus, I’d like to start Jupiter with a question: When is enough enough? Most people are in love with Jupiter for its abundant blessings but often ignore the fact that there really can be too much of a good thing with apologies to Mae West. What do you overdo in your life and what are the consequences? In what areas of life is this prevalent for you? 2. Now let’s take a mini-research break. Leap onto your favorite search engine. Explore (your choice) either Jupiter the planet or the god Jupiter from mythology. To which characteristics of the planet or god do you resonate? What about Jupiter stands out for you? a. Does your Jupiter sign, in your opinion, blend will with the general mission of Jupiter? Why or why not? c. What’s the element of your Jupiter? (Earth, Air, Fire or Water) How does that blend in helping or hindering you to enjoy your favorite Jupiterian characteristic in 4b? d. How’s the blend of your Jupiter with your other planets? Mostly easy or challenging? e. How many planets make a major aspect to Jupiter ? g. Do these aspects make “doing Jupiter things” easier or more challenging? 4. Who was “Jupiter” for you at an early age? This person might have seemed like Santa Claus. What role did he or she play in your life? Extra Experience: Do something spontaneously generous or fun today. Journal what it felt like to be Jupiter. Next we’ll be casting our lines for Saturn. And don't forget, these fishing trips are self-paced. You can cut and paste the posts into a document and get to them whenever it's convenient, though it's really fun to do it together in "real time" this May when we can share observations and insights in the Comments. Photo Credit: Statue of Jupiter by Andrew Bossi under Wikipedia common license. Late 1st century AD, marble. Drapings, cepter, Eagle, and Victory are made of painted plaster dating to the 19th century. Don’t forget to Comment and let us know what insights you catch! Every comment is entered into this month’s contest for a free e-book. Too much of a good thing is wonderful. Exactement! Greetings from Sun, jup conjunction in Sag! Are you sure you're not Santa Claus? I think Santa would also have Sun conjunct Jupiter in Sag.